Brian Thacker Travel Writer | Travel highlights of 2009. My perfect day started at 5.00 am where I was met by my ‘driver’ and his horse and buggy. We rode in the dark to a temple in the middle of a field then climbed it to watch the sunrise over an endless and magnificent multitude of temples dotted across the countryside. The rest of the day was spent riding from one temple to another and each one was just and incredible and unique as the one before. It’s nice to get a bit of over-the-top luxury now and again. Particularly when my girlfriend Beth and I had been staying mostly in cheap, dirty dives as part of the travels for my new book about.. well, staying in cheap, dirty dives. But this was something truly special. The Majestic Hotel (which used to be a cheap, dirty dive in the 70s) now lives up to it’s name. The rooms were stunning, the food was out of this world and the bed was the most comfortable bed I have ever slept in. 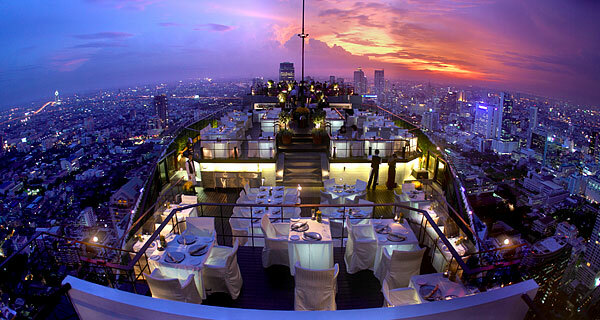 Vertigo, Banyan Tree Hotel, Bangkok. Vertigo is right. The rooftop restaurant is on the 61st floor of the Banyan Tree Hotel and Beth and I were lucky enough (or unlucky if you’re scared of heights) to get a table right on the edge. To enhance the spectacular views there is only candlelight at the table and the waiter uses a torch to show you the menu and show you your food when it arrives. We were quite giddy by the end – but that may have had something to do with the wine that accompanied each course of our ‘banquet’. I loved Stuttgart so much I went there twice. The first time was as part of my book tour for ‘Couch Surfing – Eine abenteuerliche Reise um die Welt ‘. My bookshop ‘talk’ was the best attended of my tour and I had a lovely afternoon wandering the streets (and beer gardens). I came back to Stuttgart at the end of my tour for Canstatter Volksfest (Germany’s second biggest Oktoberfest) and did all those fun Oktobefest things like drink lots of beer, danced the polka and queue for 20 minutes to go to the toilet. This couldn’t have been more idyllic with our cute little wooden cabin right on Lake Superior (as in take one step out the door and you’re IN Lake Superior). And the big open fire certainly came in handy (the large piles of snow gives you an idea). We had lovely walks through the snow and it was so romantic when we saw a bald eagle tearing apart some road kill on the road near our cabin. I was in Ubud for the Ubud Writers and Readers Festival and the highlight was the three-hour ‘Jalan Jalan’ walk that I led through the Ubud countryside (well, when I say ‘led’ I did get lost in the first 10 minutes). And we ended the walk at a gorgeous villa overlooking the rice fields for a breakfast of smoked salmon and crusty bread, fresh juice, croissants and apple danishes. I spent a few days riding around Mandalay. 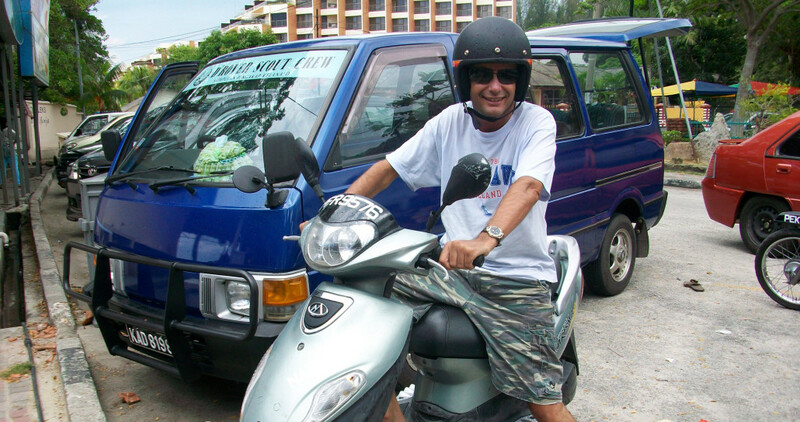 I visited impressive temples, local restaurants and well, generally just rode around a lot checking out the city. And the highlight of my highlight was going to see the Moustache Brothers. The brothers are a comedic trio that perform ’shows’ in their lounge room that combine wacky comedy routines, classic Burmese dance and satirical criticism of the totalitarian Burmese military regime. One of the brothers served six years in a labour camp for telling a joke about the government. Batu Ferringhi is apparently the single most heavily developed stretch of tourist resorts in Malaysia, but the southern end of the long stretch of beach was quiet, the guest houses were nice (and cheap) and the handful of beach side restaurants (as in right on the beach) were delightful. It was my girlfriend Beth’s favourite place we travelled to. Peterson is a cutesy tiny town in the south of Minnesota (near the border of Iowa) with plenty to do. We went canoeing on the Root River, cycling on the Root River bike track, stayed at a cutesy B&B, ate at cutesy restaurants and shopped in cutesy shops. I spent a few days on a bicycle riding around this stunning town and it was one of those places that I just didn’t want to leave. Great food, great bars, great scenery and even a great bowling alley. I don’t know what is in store for me travelling wise in 2010 (so far only a trip to Bali), but that’s what I love about it. Life, like travel, is a great big adventure. Adventures on and in the water. The 10 most exotic places to get married. From kartoffelpuffers to nasi goreng. I’ve been to Bali, too.